I'm writing hoping that the first months of 2014 and the year of the horse have been safe and happy for you and your loved ones. We have had an onslaught of good news: the launch World Health Organization's new online library of road safety campaigns, Vietnam's new decree on helmet quality, and the passage of the National Road Safety Policy in Cambodia. Our teams have been hard at work to build on this progress, notably the completion of four experimental trials to promote child helmet use in Thailand and the expansion of the Walk Wise project in China. News Update: WHO hails Vietnam's new rule on crash helmet quality – A new regulation requires motorists to wear helmets certified as meeting national quality standards from January 1. Under Decree 171, the penalty for wearing a substandard helmet is similar to the one for not wearing a helmet. 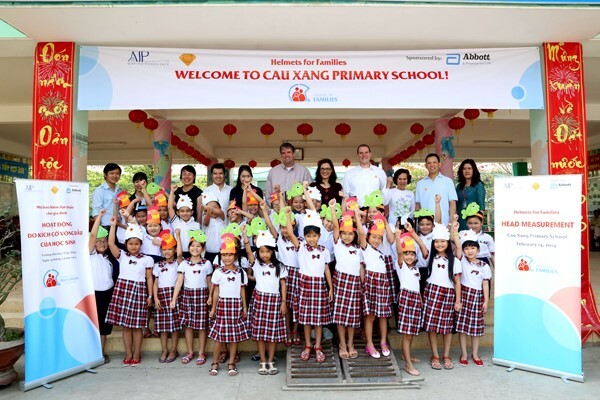 Abbott Laboratories and AIP Foundation visited 1,094 students at Cau Xang Primary School in Binh Chanh District of Ho Chi Minh City to measure head sizes for an upcoming helmet donation. Cau Xang is one of four schools participating in Helmets for Families, through which Abbott and AIP Foundation will donate helmets for 4,291 students and 181 teachers. 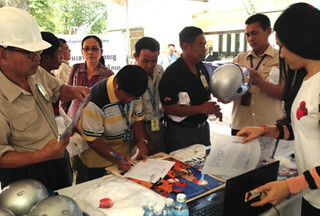 The project will also subsidize or exchange helmets that meet the national standard for the students' parents. Helmets for Families aims to raise awareness among students and parents of the safety value of wearing helmets that meet the national standard. By donating free and subsidized helmets, as well as exchanging parents' substandard helmets for new standard helmets, Abbott and AIP Foundation hope parents will model for their children the positive habit of wearing standard a helmet. In the 2013-14 school year, the program is being piloted at four primary schools in Binh Chanh District and District 12 of Ho Chi Minh City. In the next two years, Helmets for Families will be expanded to areas of the Mekong Delta and Hanoi. AIP Foundation and local government partners in Hanoi organized a "Kids love helmets" Family Day at Le Loi Primary School in Ha Dong District on February 15. Singers Thai Thuy Linh, The Voice Kids, and Duc Anh from The Doremi show performed at the event to raise awareness about the importance of putting helmets on children. The "Kids love helmets" Family Day was organized for students and parents, and included many fun activities for learning about traffic safety. Children had the opportunity to engage in many games, learn how to use helmets, and talk with famous artists about traffic safety. More than 2,000 people including students, parents, and representatives from the Ministry of Education and Training, National Traffic Safety Committee, Police Department, Hanoi Traffic Safety Committee, and Department of Education and Training, joined the event. Family Day is one of the main activities of a national public awareness campaign in Vietnam, titled "Children also need a helmet," which began in 2011 with the goal of improving the rate of helmet use among children, correcting parents' misconceptions about child helmet use, and increasing awareness about road safety. The "Kids love helmets" Family Day in Hanoi is the last activity of Phase III of the campaign, which ran from September to December 2013. 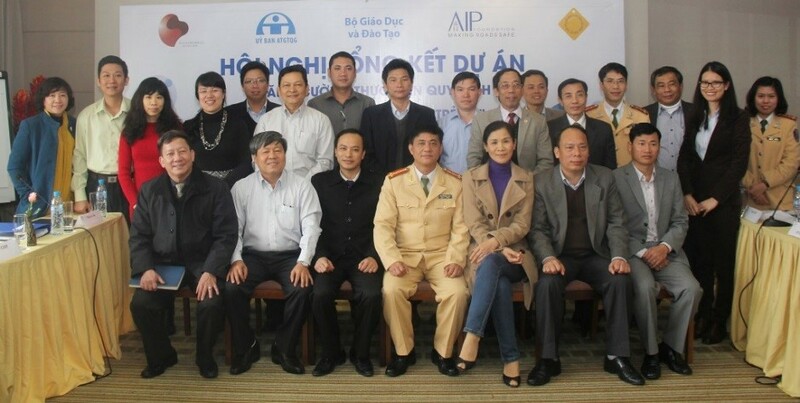 A national workshop on child helmet use took place in Hanoi on February 18. 36 attendees, including government and international representatives, reviewed the implementation of the national campaign "Children also need a helmet" over the last three years. Participants also discussed a national plan to sustain and further increase the child helmet wearing rates in 2014. Nguyen Dieu Nuong, AIP Founation's Director of Programs lead discussions with strong support from the National Traffic Safety Committee, Ministry of Education and Training and National Traffic Police (C67), in creating and implementing a national school helmet manual. The manual will be a comprehensive guide, providing a compilation of best practices to increase helmet rates in schools, how to set school policies, recommendations, evaluations and implementation. The manual will leverage the success of the "Children also need a helmet" campaign and ties in with the advocacy work being placed to urge the government to enforce the child helmet law nationally. 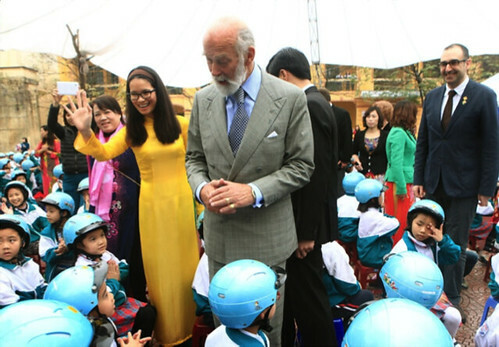 His Royal Highness (HRH) Prince of Kent, Michael George Charles Franklin, attended a Helmets for Kids kick-off ceremony, organized by AIP Foundation at Van Phuc Primary School in Hanoi on February 28. On this occasion, the FIA Foundation donated more than 1,100 helmets to students and teachers. HRH Prince Michael also presented the Prince Michael International Road Safety Award to Vietnam Television (VTV) in recognition of VTV's positive contributions to road safety awareness in Vietnam. At the start of the event, HRH Prince Michael of Kent visited with students as they participated in road safety-themed activities and talked with them about the importance of road safety. Students decorated helmets, practiced their knowledge of traffic signs, and competed in a bicycling contest. During the ceremony, Mr. Antony Stokes, Ambassador of the United Kingdom to Vietnam taught students how to wear helmets correctly by showing them the three steps of helmet wearing. Ms. Nguyen Thi Thu Ha, representative of VTV, received the Prince Michael International Road Safety Award to recognize the achievements of VTV in raising awareness about road safety nationwide. As a government-owned television station, VTV plays a vital role in disseminating information to the public. The station provides instant updates on new government traffic regulations and hosts traffic safety-themed television segments, including "Traffic Story on Sunday" and its annual broadcast commemorating the World Day of Remembrance for Road Traffic Victims. Check out the photos & press release! News update: Plan aims to cut road deaths – The National Policy on Road Safety, passed by the Council of Ministers on Friday February 21, is an expansion of the existing Road Safety Action Plan for 2011-2020. It will see the budget for the project quintupled, from $2 million a year to $10 million a year. Under the new policy, Cambodia will implement the United Nations' five road safety strategies, as well as three Cambodia-specific plans to reduce road traffic crashes in order to prevent deaths, injuries, disabilities and property loss and the effects on environment in the Kingdom of Cambodia. AIP Foundation has been advocating for approval of the National Road Safety Policy and 10-year Action Plans for many years. During the 2012 and 2013 National Road Safety Weeks and a number of occasions AIP Foundation Cambodia Country Director appealed to the government to approve the National Road Safety Policy, it's 10 Year Action Plan, and the draft amendment of the motorcycle helmet law. Moreover, through its joint statement submitted to H.E Minister of Transport in January 2013 which was officially released in April 2013, in coordination with Handicap International and Coalition for Road Safety, AIP Foundation again encouraged Cambodia's government and legislative bodies to approve the policy, the draft passenger including child helmet law and the three-year helmet action plan. The statement was supported by over 100 stakeholders, and was specifically referred to in the UN Secretary-General's report Improving Global Road Safety Report in November 2013. On January 28, Greig Craft, President of AIP Foundation met with H.E Lt. General Ouk Kim Lek, Secretary of State of Ministry of Interior to discuss the continuation of the partnership between AIP Foundation and the Cambodian National Police. The aim of the meeting was to gain support for AIP Foundation's new future programs for motorcycle passengers, including a child helmet campaign. The Interventions include, school based programs, behavior change campaigns and advocacy support. Other topics discussed in the meeting included the possibility of a constructing a non-profit Protec Helmet factory in Cambodia. From February 17-19, members from Centers for Disease Control and Prevention (CDC) visited Cambodia in efforts to improve current helmet observation methodologies. During the visit CDC met with AIP Foundation's research partner to discuss observation studies. 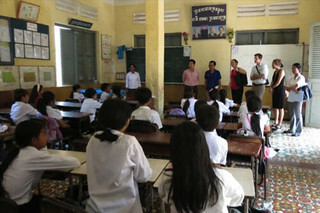 They joined field visits to project sites and joined a helmet observation at a target school in Phnom Penh. With the support and guidance from CDC, AIP Foundation aim to improve their current helmet observation methodologies to provide clearer data. From January 24-25, Helmets for Families, sponsored by Manulife Cambodia, organized road safety activities at Wat Preah Put Primary School in Phnom Penh. To follow-up on Manulife's donation of 647 helmets to students, teachers, and mothers last month, 100 students participated in extracurricular activities, including a road safety question and answer (Q&A) session, drawing contests, and safety lessons for pedestrians and bicyclists. 50 parents learned about the importance of helmet use for themselves and their children. Post-donation education reinforces the importance of helmet use and safe road behavior and encourages students and parents continue to wear their helmets consistently and properly, especially during the Lunar New Year celebrations, when road crashes are on the rise. AIP Foundation in partnership with Chevron, trained 400 students from Hun Sen Bun Rany High School in helmet safety on January 28. 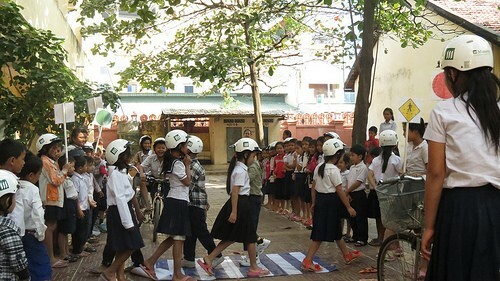 Students learned about the impact and scale of road crashes in Cambodia, the importance of wearing a helmet to prevent road injury, and how to wear a helmet correctly. Following the training, students committed to wear helmets no matter distance and time, and they individually signed the petition to support mandate for passenger, including child, helmet use. These activities follow Chevron's December donation of 900 helmets for teachers and students at Hun Sen Bun Rany High School. This donation contributes to broader a public awareness campaign for passenger helmet use. Monitoring and evaluation is ongoing throughout the 2013-14 school year. On February 7, AIP Foundation joined the U.S. Embassy's Seventh Annual Health Fair in Phnom Penh to raise awareness about the importance of helmet use. AIP Foundation was nominated to be a stall-holder at the Fair, where it displayed promotional materials, Protec helmets, general road safety information, and background on its projects. Approximately 500 people attended the Health Fair and many expressed interest in the work of AIP Foundation and road safety in Cambodia. Following helmet donations from private sector partners, Manulife Cambodia and Chevron, the assemblies reinforced students’ road safety training and encouraged them to share the information with their friends and family. At the assemblies, students were informed about general school issues and then asked questions to test their recall of knowledge about helmets, traffic laws, and road safety with prizes for correct answers.